Cattle stress unleashes massive changes in the body chemistry of cattle, which is bad news for anyone trying to produce tender flavorful beef. I've written several articles on this website identifying all the different ways that livestock stress can creep into your cattle finishing program and how to prevent this. In this article I'm going to explore the chain-of-events that happen deep within meat fibers when cattle experience stress and explain how those changes undermine beef flavor and make meat tough. When we talk about stress, we tend to talk about adrenaline: adrenaline is released in response to stress, adrenaline makes muscles tense, and adrenaline ultimately leads to beef being tough and flavorless. But this is an over-simplification - there's actually more to the story of how livestock stress affects meat. Understanding what is really going on will help you design a better cattle finishing program and help you to consistently produce more tender flavorful beef. To understand how cattle stress affects beef we have to start our story with a closer look at sugar and the steps that our bodies take to convert food into energy. All muscle movement is powered by sugar. The body generates the energy needed for muscles to move by releasing sugar (known as glucose - a simple form of sugar) into the bloodstream. This glucose is then oxidized (burnt) by the muscles as the energy source that drives muscle movement. But where does this glucose come from? When cattle eat carbohydrates, sugars, and fats, these are all converted to glucose by the digestive system. Even protein must be converted to glucose in order for the body to use protein as an energy source. This glucose is then transported via the bloodstream to where it is needed in the body. Our own bodies function the exact same way. Glucose is the fuel that all our bodies use for energy. Everything from cheese burgers to cotton candy and grass in the pasture must be converted to glucose before their energy can be accessed by our muscles. Carbohydrates and fats take time to convert to glucose, which is why the energy we get from a meal is spread out over many hours instead of all being available at once. Glucose, on the other hand, doesn't stick around for very long. It is a very short-term sugar that gets carried around our bodies in our bloodstream. It either gets used right away or it is rapidly converted into a more stable form. There are two different types of storage systems in the body to store glucose. Glycogen and fat. Glycogen is a more complex form of sugar, formed by simply joining multiple glucose molecules together. If glucose is not used immediately to produce energy, it bonds to other glucose molecules so it can be temporarily stored as glycogen in the muscles and liver. But for a truly long-term storage solution, glucose and glycogen are converted to fat, which is stored inside the body's fat cells so the energy can be cached for later use. It's actually a pretty efficient system. Excess glucose-glycogen that is not used immediately to produce energy is converted to fat. Fat allows the energy from glucose-glycogen to be stored indefinitely until a time when we don’t have enough readily-available glucose-glycogen left over from our last meal. If we run out of glucose-glycogen, our bodies simply tap into these fat reserves to reconvert some of this fat back to glycogen, and then to glucose, to provide our muscles with fuel. Whenever cattle (or humans or any other mammal) experience stress, their bodies release adrenaline into the bloodstream. This adrenaline provides muscles with a chemical signal to prepare them for action. This chemical signal accomplishes two things. It tenses the muscles, like coiling a spring to ready it for action. And it triggers a huge and very rapid conversion of stored fat back to glycogen so that the muscles have a ready supply of fuel waiting in case immediate high-energy action is required. The body can’t tell the difference between stress caused by a wolf - which requires a high-energy response - or by disease, excessively hot weather, or a nutrient imbalance, which do not require a high-energy fight-or-flight response. As far as cattle physiology is concerned, it's better to be safe than sorry. It's a great survival strategy, but not so great for beef production. The muscle tensing caused by short-term stress persists even after slaughter. Muscles don't just relax back to normal just because the butcher's hammer makes the lights go out. That's partly why stress at the slaughterhouse, during transport, or in the last few days before slaughter will lead to tough beef. As I mentioned above, adrenaline provides a signal to convert massive amounts of stored fat back into glycogen. The body isn’t taking any chances; from an energy standpoint it's a very effective way to prime the muscles by preparing a massive energy reserve in case an extreme muscle response is required. Adrenaline literally floods the muscles with available energy in the form of glycogen. And when that burst of energy is required, it's pretty impressive how much muscle power this can release. This is why people are sometimes capable of staggering feats of strength during an emergency. Unfortunately for beef producers, the fat that is converted back to glycogen by the adrenaline surge is the precious fat stored deep inside the microscopic intramuscular fat cells. Yup, these are the same microscopic intramuscular fat cells required for beef tenderness and flavor. The cost to farmers producing beef is enormous because the adrenaline released by cattle stress is essentially sucking fat out of the very same intramuscular fat cells that are vital to making beef tender and flavorful! As glycogen breaks down (as it is oxidized by the muscles and converted to energy), it produces a by-product called lactic acid. Lactic acid is the stuff that makes our muscles sore after we use them. It is also acidic. And it takes a considerable amount of time for the body to break it down and expel it. A little lactic acid from regular muscle activity is not a problem. Our bodies are designed to break it down and expel it at a rate that keeps up with regular muscle activity. But during heavy exercise or when the body tenses up and floods the muscles with glycogen as an adrenaline-triggered response to stress, the oxidization of so much glycogen floods the muscles with more lactic acid than the body can get rid of right away. This build-up of lactic acid is what makes our muscles burn during heavy exercise. For the beef farmer, this surge of lactic acid is a real problem. Lactic acid is acidic and it changes the flavor of the beef. The more stress that cattle experience, the more lactic acid will build up in the beef and affect meat flavor. Furthermore, when cattle are under stress at the time they are slaughtered, the massive flood of glycogen that was released by the adrenaline-trigger will still be present in the muscles after the cattle are slaughtered. And the problem with stress is that it takes a long time to fade. Even if the slaughter process itself was stress-free, an event that occurred weeks earlier can still be causing stress, which may be causing extremely high concentrations of glycogen to persist in the muscle tissue when the cattle are slaughtered. Unused excess glycogen in the muscle tissues at the time of slaughter is a very bad thing. It simply stays within the meat. With no-where to go, it breaks down and also converts to lactic acid. Once the animal is no longer alive, this lactic acid is no longer being actively removed from the body. Instead it builds up in the meat, increases the beef acidity, and degrades beef flavor. In cases of extreme stress or if cattle have experienced prolonged stress over extended periods of time, muscle tissues are flooded by so much of this highly-acidic lactic acid after slaughter that the meat tissues begin to break down. This causes the beef to become soft, mushy, dark and sticky, like a bruise. Flavor deteriorates, it looks unappetizing, and its shelf life is dramatically reduced. High-stress cattle with this type of beef are known as ‘dark cutters'. This beef is so badly damaged by the effects of cattle stress that it typically must be marketed via alternative outlets, sold at a severe discount, or the effect can be so bad that the meat must be thrown away altogether. 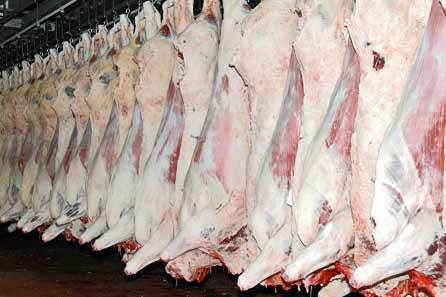 Between 1% to 2% of all beef in the United States are dark cutters. Luckily all these negative effects of cattle stress on beef are entirely preventable. Simply understanding the chain reaction that stress unleashes on cattle body chemistry is enough to motivate you to start hunting down and eliminating sources of stress in your cattle's lives. And it's not just the farmer raising the cattle that needs to be on the lookout for potential sources of cattle stress. The truckers transporting cattle to the slaughterhouse and the handlers and slaughterhouse workers also have to do their part. If you take the time to troubleshoot every stage of the cattle production process from birth to slaughter to minimize potential sources of cattle stress you'll be well on your way to consistently producing tender flavorful beef. Want to learn more about how to eliminate cattle stress? There are two books that I highly recommend, which teach low-stress handling practices and explain how to build low-stress cattle handling facilities. Moving 'Em: A guide to low stress animal handling by Burt Smith is my absolute favorite book about low-stress cattle handling. 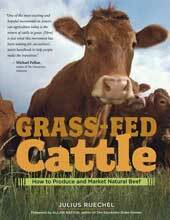 Your cattle herd will teach you volumes about cow psychology and will provide you with endless hours of entertainment as you experiment with all the cool tips and low-stress handling strategies discussed in this book. And I also highly recommend Humane Livestock Handling: Understanding livestock behavior and building facilities for healthier animals by Temple Grandin. She is considered the world's expert in cattle handling facility design thanks to her unique perspective into how cattle think and perceive the world. In addition to providing valuable insights about how cattle experience the world around them, her book will help you design a much more robust low-stress cattle handling facility and identify potential problem sources in slaughter facilities when you set out to choose a slaughterhouse for your beef production program. Do you have any tips for reducing cattle stress? Eliminating cattle stress to prevent it from undermining your beef production efforts requires being extremely conscientious of how your behavior, your handling protocols, your infrastructure, and your grazing and feeding strategies affect your cattle. If you have any stories or tips about tracking down and eliminating cattle stress, please share them in the comments section below or tell me about them by using my contact form. Thanks for taking the time to read my article. I hope you've enjoyed it. If you'd like to be notified when I release future cattle farming articles, sign up for my email notifications or follow me on Facebook or Twitter.